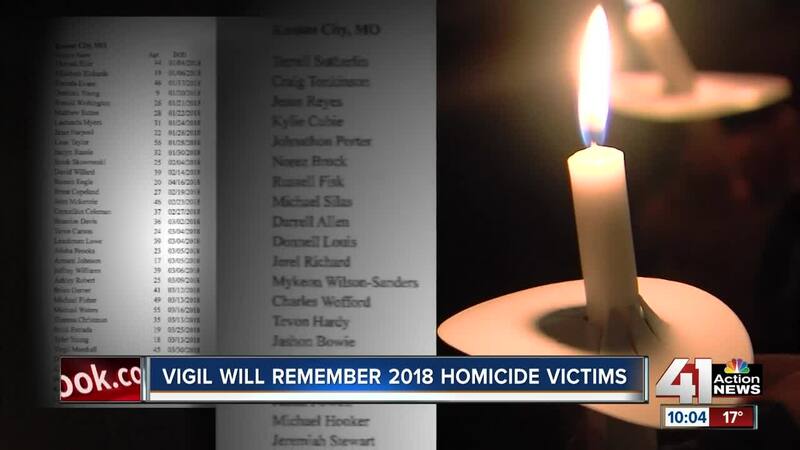 AdHoc Group Against Crime members took part in a vigil Saturday to remember the 208 people who were killed in homicides in 2018 the Kansas City metro area. KANSAS CITY, Mo. — AdHoc Group Against Crime members took part in a vigil Saturday to remember the 208 people who were killed in homicides in 2018 the Kansas City metro area. The name of each victim was read aloud during the ceremony, which hamered home the impact and immensity of the lives lost, including 134 people who have been murdered so far this year in Kansas City, Missouri. “Its sad (that) 208 people died this year,” said Jessica Dydell, whose son was murdered in 2016. But the AdHoc group also wants to focus on solutions. “First and foremost, speak up when they see something wrong," Damon Daniel with AdHoc Group Against Crime said. He hopes for "a peaceful year where we can work together to make the community thrive, so our young people who are coming up behind us can inherit a world so much better than we did." AdHoc conducts the same somber vigil at the end of every year. If there's good news, there have been fewer murders in KCMO this year than the 151 in 2017. “People are moving away because they don’t want to live in KC," Dydell said. "'Oh, you will get killed if you go out. You can get killed if you go to the grocery store.'" The small gathering of people held candles and sang Saturday night. The hope for 2019 is that more people will join in the chorus for peace. “We, as a community, have to do something," Dydell said. "We can't just wait on the police, investigators. We cant depend on them. We have to get out and speak up. No one wants to speak up."